Although Blayne Enlow is still in search of his first win in 2018, the statistic is of little concern to the Twins No. 9 prospect. 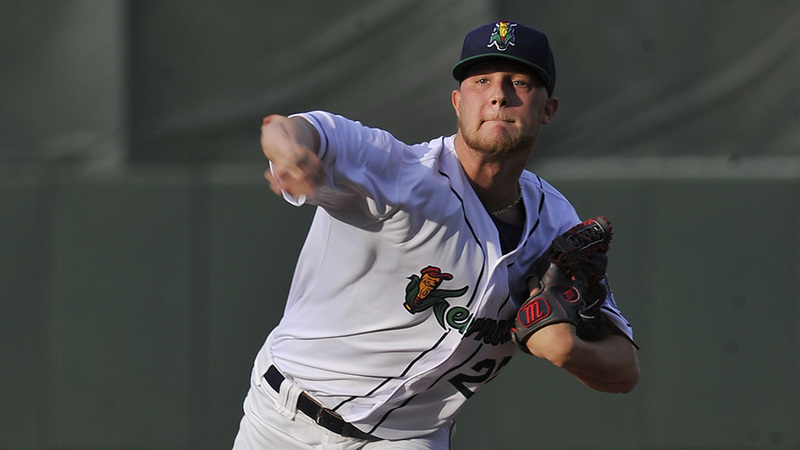 Enlow followed up his first scoreless outing of the season with his second, this one the longest start of his professional career, yielding one hit and four walks over six frames before Class A Cedar Rapids fell to Kane County, 3-2, at Northwestern Medicine Field. The 19-year-old recorded a personal-best six strikeouts and improved his ERA to 3.28 in 24 2/3 innings this season. "You can't worry about stats here," he said. "People will see what they see when you're out there, and you can only control so much as a pitcher. I can't control whether our team gets hits or whether the other team gets more than we do. I can only control every single pitch and compete with each one to the best of my ability." That ability was stifled toward the end of April after he tweaked his back and missed two starts. Enlow said he's feeling 100 percent, but his coaches still have him on a pitch count, which kept him to 9 2/3 innings over his past three starts. Even with the limitation, the Louisiana native thinks he could have gone extended his career-long outing. "I walked too many guys out there tonight," he said. "I could have given up an inning, or even two with that, and I felt like I could have gone farther, but hey, pitch count is pitch count." Despite a pair of walks in the first, Minnesota's 2017 third-round pick cruised through the first three frames before running into trouble in the fourth. After Enlow struck out Yoel Yanqui to start the inning, Renae Martinez lined a single to left before Ernie De La Trinidad reached on a catcher's interference call. A four-pitch walk to D-backs No. 11 prospect Eduardo Diaz loaded the bases with just one out, but Enlow managed to escape unscathed after coercing a ground-ball double play from Arizona's 27th-ranked prospect Eudy Ramos. "I told myself I really needed to start making some pitches, and I just trusted my fastball there," he said. "I got it where it needed to go: inside. It did exactly what I wanted it to, and I got that grounder to third, and they turned it. I can't pitch like I did without them. I feel like [the defense] did a good job behind me today." Enlow said that Spring Training in Fort Myers gave him perspective on the type of grind he would experience as a professional baseball player. The daily intensity showed him just how much he has to, and does, love the game and, in his first full professional season, he already holds some lofty goals. "As a pitcher, you've got to be really consistent at what you do, and you have to own it," he said. "You've got to have this bulldog mentality that you're 'the man' out here. It might not be true all the time, but if you go in like that every game, it'll help. "I just want to be out there every game trying to get a little bit better to try and reach my full potential as one of the greatest to come out here. I don't wanna just make it, I want to be the best." Enlow exited with the lead after Shane Carrier knocked a two-run homer to center in the sixth. The Cougars stole the win with a three-run ninth, collecting four of their five total hits in the frame. De La Trinidad evened the score on an RBI double to left, scoring William Gorman, before Diaz knocked a walk-off single on the ground to right.